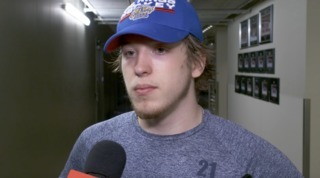 The Edmonton Oil Kings continue to find new and exciting ways to win games heading down the WHL’s regular season stretch. The Oil Kings (27-15-4-4) trailed 3-0 near the midway point of the game and 3-1 with just over seven minutes to play but rallied to a 4-3 shootout win over the Brandon Wheat Kings (20-19-3-4) in front of 5,299 fans at Rogers Place on Tuesday night. 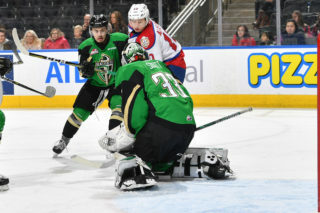 The 3-0 hole the Oil Kings found themselves in early wasn’t for a lack of trying, as they ran into a hot goaltender who no doubt had today’s game circled on the calendar for months. 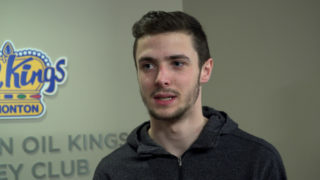 Sherwood Park native and rookie Ethan Kruger (5-6-1-2) made his first career WHL start at Rogers Place and was outstanding, turning aside a total of 46 shots and surrendering just three, plus one in the shootout. At the other end of the rink Todd Scott (6-1-2-0) delivered another win in his second start in three days. Scott has now pieced together a string of five-straight wins, making 21 saves in regulation and overtime, plus all three shots he faced in the shootout. The game winning goal came off the stick of Trey Fix-Wolansky who, although it won’t show up on the stat sheet, scored for the first time in five games. He added an assist on the game’s first goal to help guide the Oil Kings to a record of 6-1-0-1 in their last eight games. Ridly Greig’s tenth of the season came just 1:01 into the game to give the Wheat Kings a 1-0 lead. 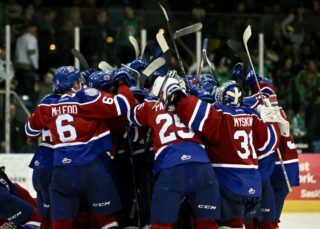 It was the lone goal of the opening frame, which saw the Oil Kings outshoot the visitors, 17-7. Again in the second period the Wheat Kings struck early, taking a 2-0 lead just 1:05 in on a goal by Ben McCartney. Just over five minutes later Luka Burzan tallied his 27th of the season to extend the gap to 3-0, but the Oil Kings would soon find their way onto the scoresheet. Fix-Wolansky wired a shot towards the goal that was tipped in by Vladimir Alistrov for his seventh of the season to get the Oil Kings on the board and cut their deficit to 3-1. Conner McDonald earned the secondary assist at 9:51 to round out second period scoring. Shots on goal again favoured Edmonton, but this time by a much lesser margin, 13-11. In the third, Josh Williams notched his third goal as an Oil King and seventh point in as many games with the Club, cutting the Brandon lead to 3-2 from Carter Souch and McDonald at 12:53. With just over five minutes to play in the period Wheat Kings defenceman Braydyn Chizen was called for a check to the head penalty on Andrew Fyten and assessed a five minute major and a game misconduct. On the ensuing major power play the Oil Kings would tie the game on the stick of none other than Fyten – a tip off a Williams shot – with Souch earning the other assist with 2:22 remaining in regulation. After a scoreless overtime period the game headed to a shootout where the Oil Kings elected to shoot first. 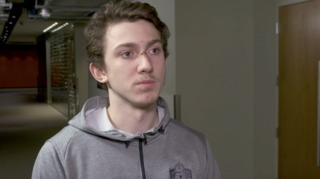 Josh Williams (X), Vladimir Alistov (X) and Trey Fix-Wolansky (Goal) went to centre ice for Edmonton, while Ben McCartney (X), Stelio Mattheos (X) and Luka Burzan (X) were all denied by Scott. Shots on goal in the third period were an overwhelming 17-3 Edmonton, and 3-2 Brandon in overtime for a game total of 49-24, Oil Kings. Brandon was 0-for-1 on the power play, while Edmonton finished the game going 1-for-4 with the man advantage. Ethan Kruger (BDN) (3), Conner McDonald (EDM) (2), and Trey Fix-Wolansky (EDM) (1) were selected as the Three Stars of the Game. 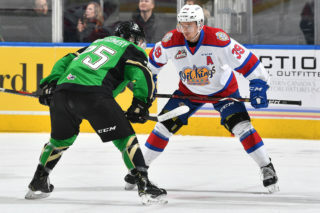 The Oil Kings take to the road for their next game when they take on the Prince Albert Raiders on Friday, February 1 at 6:00 PM MT (7:00 PM CT). After taking on the Saskatoon Blades – also on the road – on Saturday night, the team returns home to host the Prince Albert Raiders for a 7:00 PM MT start on Monday. The home game vs. Prince Albert at Rogers Place was originally scheduled on Wednesday, February 6 but instead will take place on Monday, February 4 at 7:00 PM MT.